He’s probably the luckiest man in football, and one of the luckiest in Britain, all things considered. Available for loan if we're unable to get rid of Fellaini apparently. Lots of clubs interested according to the BBC. John O'Shea was a better footballer than McTominay though. If McTominay had the balls to nutmeg Figo I wouldn't mind his limitations but he doesn't show much. By 22 he should be starting to show something. See this is why most people don't rate him because he doesn't do fancy stuff that looks cool on social media. But it's not a problem for him cause the manager rate him. No it's not because he doesn't do fancy stuff, it's because he doesn't really do anything. He played 80 mins the other day against Reading before I actually saw him do something other than just be a willing body. Not sure how to feel about McTominay. Definitely will say that he doesn't have the passing range required to be a PL starter and think he would struggle if pressed. A good example of the passing range was at the end of the last match where he just dribbled the ball all the way to the half-way line and then dumped it to Dalot so that Dalot could try the complex pass. In reality, McTominay should have hit a curved through pass to Lukaku to set him in on goal before reaching the halfway line. However he must be doing something right to be getting game time still under Ole. He has had bad positioning before (i.e. Chelsea goal at OT last year) so I don't know if that is a strength either. He didn’t even seem aware that there was an overload on the left. It was maddening. He just trundled along and passed the buck to Dalot on the overlap. Let's face it. He has had many chances and he absolutely tried to take them. Unfortunately he's shown that he isn't good enough to play for United. So no hard feelings, but let's move on. I'd rather keep Fellaini than persist with this guy tbh, the definition of a nothing player. Tom Cleverly levels of nothingness. He’s not good enough for our level obviously but I would rather give him chance and hoping that he can make it somehow than spend money on average players or some players that won’t be used. Cheap wages, it won’t hurt us in both financially and the structure of the club if we want to restrict the amount of wages that we need to spend on backup players. Nothing personal against the lad but let’s be honest he is not good enough. Good luck to him wherever he goes. Once again, very good news if true. It has been long enough that our club played mediocre players. Time has come to stop doing it. Surely, McTominay could become a decent player and as such may be sold for a decent fee - so a loan may help in this regard. But, alongside Fellaini, Jones, Valencia, Rojo, Darmian, it is about time for McTominay to move. He doesn't belong here - simply due to not high enough football talent. Perhaps he may become a good player if he plays week in and week out. However, being simply a "good player" is not good enough for Man Utd - here we need brilliant and excellent players in the starting eleven, with some very good players (and young hot prospects) on the bench. I agree. There doesn't seem to be a great deal about him. A loan is the best solution, preferably to a Championship club. It's a loan ,not a sale which will be good for Mctominay. He will comeback here become better player. A loan would be great for him, see what he's about. He's obviously not set the world alight so far, but I think he was kind of thrown under the bus a bit by Jose at times. He has the attributes you'd want in a defensive midfield player. Obviously, from what I've seen so far I don't think he's 'top 6 quality', but that could change with a couple of loan moves and a new manager getting a look at him next season. I'm not saying Ole couldn't be that man, but when we're really going to be pushing for top 4 and maybe a trophy, it's difficult to fit someone like McTominay in the side. Fred and Fellaini are more likely to get in, or we'd play 4 attackers etc. He's just got no game-time available once we get a couple back from injury. I also think he should go on loan next season at some point too (depending on our transfer activity), but that's a discussion for another time. Eventually, I just expect him to be a replacement for the likes of Rice or Neves when a bigger side poaches them. And to think he was played in defence by Mourinho to send a message to the board. He might still turn into a player, but it's clear he isn't ready yet. He needs first team football regularly now every week. What Mourinho did with him was really unfair, threw him like a lamb to the slaughter after praising him so highly. Considering he's 22 already (Thought he was younger) he's still really green, so will need to improve his all round game to stay at this level. 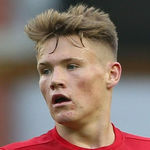 Man Utd midfielder Scott McTominay has been heavily linked with a loan move to Celtic but with Fellaini out injured for the next few weeks, Solskjaer hinted the Scotland international may be staying put. “Scott is working hard. He is a young boy I believe in. We are working on his contract. This could work in McTominay's favor because I think he'd rather stay and fight for a place knowing he's 5th/6th in the pecking order as opposed to being on loan and possibly not getting regular starts and being forgotten. Charly Musonda Jnr, a top young talent at Chelsea failed to get the minutes he wanted on loan at Celtic (Tyler Blackett didn't get much game time either). I have no idea about Celtic's midfield options but I doubt McTominay would just walk into their starting 11. He was much better in the 2nd half, absolutely agree. He still didn't do anything really. Finally seemed to find a bit of confidence from somewhere towards the end of the game. I don't think winning the ball and then looking confused about what to do next counts as something worthy of a Man Utd midfielder myself. I think Fletcher is a good example of a player who was written off in his early days for not doing enough and then went on to become one of our most important players. Difference with him was he actually did do things, they just weren't the right things, and he did have his moments e.g. goal against Chelsea. He also didn't have the benefit of a physique like McTominay's, he was a gangly bag of bones. And even with all that, by the age of 22 he had actually become a fantastic big game player for us who, along with Park, would run the opposition into the ground. Nothing against McTominay and it would be lovely if he pulled it out the hat as I'm sure he's a great pro, but I just don't see anything in him that qualifies him to play for a team that wants to challenge for titles. No flair, average skill, doesn't use his physique all that well. If you can't see that he's average at this point, not sure what else to say. I'm sure the likes of PSG and Barca with Frenkie De Jong and Rabiot will be quaking in their boots when we line up with McTominay, i'm glad we're not wasting our time chasing world class talent, they'd only hold him back. feck Martials new contract, this is all we have been waiting for. Would be different if he was 17, but at 22 where is the upside? The look on Ole's face says "guys are you sure about this?" The look on Scotts face says "It's not april is it yet guys, holy Sh*t"
Bizarre decision. What has he done to earn a contract until he’s 26-27? If anything, we should send him on loan, because he is currently far from good enough to start for us. After the past five years I should have learned by now that this club has an amazing ability to do stuff that you look at and just think "......what? Why?" And this is yet another of these times. Looks like its the first time Ole heard of United extending McTom's contract going by that pic. Please use this forum for discussing actual player performances not transfer rumours, hair styles and other off topic talking points. Discuss those in the Manchester United Forum. I'm quite interested to see how he progresses under Ole's style of play. I'm not going to write him off yet, regardless. Fletcher came good eventually so maybe he can too. Why? What are the signs for him to be a better player? He is not our quality at all. What is the point IDK. Likely going to take Fellaini's spot in the squad if he really is about to leave.